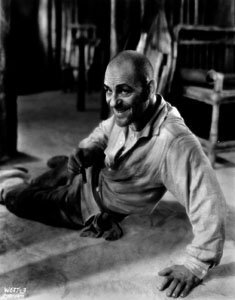 I’ve been watching a lot of silent movies lately – specifically as much of Lon Chaney’s output as I can find (the man could act with every cell of his body and is a pleasure to watch – seriously go find his stuff and savour it) and one of the things that struck me is the pacing of the movies. Without dialogue every scene has to convey all the emotional oomph and exposition in as condensed and pure a form as possible. If there is necessary dialogue then one or two captions take care of it and the rest is acted out and the movies gets on with the next scene. Once you watch a few in sequence and then go back to a more modern movie (or talkie, to be precise) it becomes obvious just how much filler there is. Some people can write good dialogue (Mamet for instance), some is perfectly functional, but some is just filler. I was wondering how this would apply to RPGs. Obviously character interaction is a vital part of the experience in role-playing and I’m not suggesting it is eschewed in the sake of bullet pointed actions and a few handwritten captions, but in terms of scene pacing I think there is something to be said for following the same rules in RPGs as are recommended for fiction – start as close to the action as possible and get out quick once the scene is resolved. By action I don’t mean just a fight or other dynamic moment like that, but rather the point of interest and choice in a scene. It’s a fine line – I suppose what I’m pitching for is efficiency without reducing atmosphere, focus without removing flavour. One thing I already tend to do is gloss over travel unless there’s a damn good reason to include it – and even then focus on the key events during the journey. Mostly it would be a case of “okay after six days of travel the city comes into view…” or something similar. Extending that to other features of the game may well sharpen things up too. If the characters decide “we should go speak to Lefty the Mob Boss” then instead of the next scene being the tentative approach to the shady nightclub, waffling around with the bouncers etc, it would start at the moment that Lefty looks at them over his desk, narrows his eyes and says “What are you punks fouling up my air for?”. This sort of thing needs trust on both sides – the players need to know you’re not unfairly putting them in danger (“Aha there are thirty other mobsters standing around you with guns pointing at you and you handed all your weapons in earlier”) and you need to know the players aren’t going to abuse their position (“I pull out my M60 and obliterate Lefty!”). That sort of trust should be in any RPG anyway in my opinion. The flashback mechanic in Blades in the Dark supports this really well – throwing the characters into the important situations while still allowing them retro-active agency to change the details, and I think I may roll out some variant of that to my other campaigns to see how much silent movie pacing I can inject into them.